Nellie Dowell, the daughter of a sailor who drowned at sea when she was only 5, was taken away from her mother, who couldn’t afford to keep her anymore, and sent to live in a poorhouse. She never had a childhood. Muriel Lester, the daughter of a well-off ship-builder, never lacked for anything. Her childhood was peaceful and full of love. Nellie started working in the match-making industry at an early age and, thanks to her job, was able to travel to New Zealand and Sweden. Muriel travelled the world too, but as a Christian peacemaker and humanitarian. Nellie struggled financially all her life. Muriel considered her wealth a burden and wanted to be free of it. The match girl and the heiress met, and became friends, in the slums of East London, where they created Kingsley Hall, Britain’s first “people’s house” founded on the Christian principles of social sharing and pacifism and Gandhi’s home while in London, and tried to bring about economic and social justice, using the Sermon on the Mount as their guide. This book is a wonderful account of the very different lives of these women, their close friendship, and their hard work for a common ideal they strongly believed in, in a world torn apart by war, imperialism, and industrial capitalism. Although not a light read, the book is fascinating and engrossing, and provides valuable insights into a little known aspect of turn of the century history in England and London. Well-written and researched, I highly recommend it to those who are interested in this historical period, the lives of the working classes, and anyone who wants to understand our modern world better. 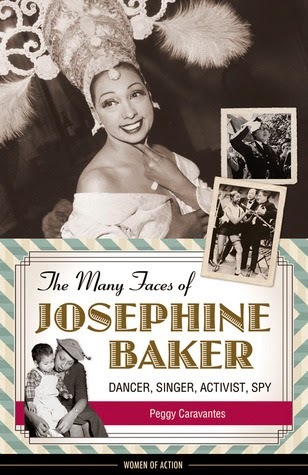 Young adults know Josephine Baker as a cabaret performer and jazz singer, if at all. But Josephine Baker was so much more than that. She worked as a spy, at a great risk for her safety, during World War II, and became a civil rights and human rights activist. Her belief that people of all races and religions could live peacefully together led her to adopt 12 children from different parts of the world. They were known as the Rainbow Tribe. But Josephine was no saint. She had a fiery temper, little education, too much pride, no idea how to manager her money, and didn’t hesitate to dump people when she didn’t need them anymore. She often comes across as unpleasant, but her shortcomings were more the result of a difficult childhood and poor education than meaniness. An example? She allowed Peron to use her as a propaganda tool, making statements that outraged the Western World. Although her heart was in the right place, her lack of education left her vulnerable and didn’t always allow her to see things clearly. But her faults make her all the more human and relatable. Despite being written for a young adult audience, the book is not dumbed down. It doesn’t gloss over her flaws, nor over the many challenges, racism and abuse Josephine had to face in her life. But it deals with them in a way that is suitable for this age group. Well-written and researched, the book also features beautiful pictures, informative sidebars on relevant topics such as 1917 East St. Louis riot, and an appendix that updates readers on what happened to the Rainbow Tribe. Overall, it’s a wonderful introduction to this remarkable woman that I highly recommend to all those who aren’t very familiar with her life and work. Belarus, 1980s. Antonia Olenski, PhD, a catty half-Jewish pianist, is married to local celebrity and composer Joseph, but is enjoying the attentions of the dashing tenor Nicholas. Their love triangle is broken up by the Chernobyl disaster, which forces Antonia to evacuate the city with her daughter Maryana. When she returns to the Gomel Music Academy, she discovers her job has been given to someone else. She’s been demoted, but is determined to regain her crown. Saved By The Bang is a dark nuclear comedy. The characters continually struggle with adversity, in a world where abuse, adultery, and deceit are common, even normal. Even the nuclear disaster of Chernobyl and its aftermath don’t faze them. People are falling ill and babies born with disabilities, but they get on with life as if nothing had happened. Their reactions to events are often absurd… or not? Although they don’t react as you expect them to, their reactions are realistic. Getting on with life despite everything, cheating, adapting, and fighting back, are all ways to survive in a world where you are often on your own. The novel is very politically incorrect, sharp, and laced with dark humour that portrays the human condition in all its rawness, misery, absurdity, and glory. If that’s your thing, you’ll love this. For most people, Lewis Carroll is simply the author of Alice in Wonderland and Through The Looking Glass. But Charles Lutwidge Dodgson, his real name and the one Wakeling uses throughout his biography, was a very complex man. Blessed with a vivid imagination which he used to create stories to entertain first his siblings and then the world, Dodgson was also an Anglican deacon, mathematician, logician, amateur photographer, artist, and supporter of the arts. He was also a devoted son and brother who took care of his unmarried sisters, a loyal friend and a man who enjoyed a vast social circle. It’s the people he cared about and associated with – his family, his friends, his colleagues, his associates, and his acquaintances – that are the real focus of this book. These included his parents, child friend Alice Liddell, artists Dante Gabriel Rossetti and Millais, poet Alfred Tennyson, publisher MacMillan, and a lot more. Drawing upon his personal database of nearly 6,000 letters, mostly never before published, Wakeling examines the relationships Dodgson had with the people he knew, loved, admired, and worked with. Because each chapter is dedicated to a different group of people (one for his family, one for his child friends, and so on) the book doesn’t follow a strict chronological order. Yet, the reader never becomes confused about dates and events. Lewis Carroll: The Man And His Circle provides fascinating insights that improve our understanding of the life of this Victorian man and the time he lived in and help us debunk common myths. But it is no easy read. I found the writing style often dry, especially when new characters are introduced. Making genealogical information sound interesting is always challenging, but it’s like the author never even tried to make such passages readable. But I had a bigger problem with the book. Wakeling is obviously passionate about Dodgson, and I can easily see why. His love for the Victorian author permeates the book, but also turns Dodgson into a one dimensional, positive, character. Wakeling is so busy defending him from all the nasty, unfounded charges that have been thrown at him throughout the centuries that he never mentions any of his flaws. While I don’t believe he was the monster some people believe he was, he wasn’t a saint either. Not one is perfect, and mentioning his flaws would have allowed the reader to better relate to Dodgson. So, would I recommend this book? If you don’t know much about Lewis Carroll and are looking for a full biography of the author, nope. This ain’t it. But if you want to know more about the people he associated with, then, despite his flaws, you’ll find this book a treasure trove of valuable information. And if you’re a die-hard Carroll fan, this book is a must. What do you think of these books? Will you pick up one or two?